I've been meaning to write about the subject of 'stories' or 'narrative' for some time. I think one of the fundamental challenges we face in Ireland right now is that of shaping a shared, compelling narrative or story about our nation's future and the path to it. We are the young Europeans, with an ancient history behind us and an exciting future ahead of us. And our time has come to take our place in the modern world; to reap the benefits of modernity and to bequeath a much better country to our children and grandchildren. I don't think that that's the story we tell ourselves now. Optimism, modernity and even the future have become tarnished by cynicism and despair brought on by the hyperbolic boom-bust we are now experiencing. But it will pass. And a new story will emerge/converge around new realities and possibilities. 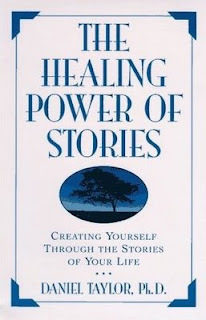 What that story might be is something I want to come back to it in a future post, but in the meantime I want to share with you some quotes from a delightful book I have just read (and re-read) called The Healing Power of Stories by Daniel Taylor. It's out of print, but Amazon's brilliant used book service will source it for you if you are interested. We are drawn to narratives because we experience our own lives as a narrative, as story. ... The human brain is so constructed that it actually processes experiences in narrative form. It seeks to integrate separate actions, actors (characters), sequence, cause and effect (the primary link between actors and actions) into a meaningful whole. ... Seeing our lives as stories, rather than as an unrelated series of random events, increases the possibility for having in our lives what we find in the best stories: significant, purposeful action. We all want very much for it to have mattered that we were here. ... Understanding my life in this way gives me better reasons than I otherwise have to live life with optimism and courage. The inability to imagine a variety of future stories for ourselves in which our lives are rich and meaningful diminishes on the everyday level the actual possibilities for our lives. ... Stories multiply our possibilities. ... This power of the imagination links the past and present to the future, and gives us the possibility not only to know things, but to create whole new realities. ... Story understands that if we do not know something emotionally we do not know it completely. ... Story is a vessel for carrying meaning. ... Detach meaning from story and both die. ... A genuine story will not leave us alone. It insists, sometimes in the most impolite terms, on changing us. Not necessarily cataclysmic, life-redirecting change, but change notheless. A good story is one that makes you good, or at least better. I mean this in the widest sense. Good stories don't simply make you a nicer or more ethical person - though some can; they draw out of you more of what makes you a feeling, giving, thinking, creating, laughing, curious human being. ... For all our individualism, we seem to have a fear and loathing of true freedom. Growing from the deterministic seeds embedded in Darwin, Marx, and Freud, and egged on by the radical scepticism of postmodernism in the humanities, the view has spread that we are powerless to shape the character of our lives. ... Stories tell us otherwise. They insist on the link between character and plot. ... What is a character? A character is a bundle of values in action. ... Everything that happens in a story has the potential for revealing and forming character. The essence of plot is characters choosing. Like it or not, story tells us we are free and therefore responsible. We may be failures but we are not robots. ... Characters in stories much choose, and are responsible for the consequences of their choices. With choosing comes significance. ... Every choice a character makes is a vote against the chaos of infinite possibilities. In a random world everything is possible but nothing significant is likely. ... Story transforms the useless freedom of chaos into the invaluable freedom of responsibility, and it does so by insisting on the significance of choices. ... By truly choosing, a character both limits freedom and gives it value. Each choice limits subsequent possibilities in a way that increases the likelihood of significance. ... Each choice in the middle [of the story] reduces the possible endings, but without those choices the end would have no meaning. Stories engage both the heart and the head and move people to action. Statistics elicit counterstatistics and move people to argue. Stories demand a response (that is, responsibility); statistics encourage a rebuttal. The power of an imagined end, and it literally can only be imagined, lies in its ability to influence present choices. I hope these few lines extracted from the book (and there were many, many more I could have chosen) give you a sense of why I think stories are so important. The stories we tell ourselves about our future as a nation - and the choices they 'make' us make - will do more to shape the country we will become in five, ten or even fifty years time than anything else we do. As Sean Lemass proved. Like I said, I'll come back to this topic again (and probably again) in future posts. gerard - there's a lot of material on narratives in the Animal Spirits book. Worth looking through that. Would also love to do some basic research on this in the Irish context. Love Taylor's book. There's a lot of this in the book Made To Stick (http://www.madetostick.com/), how creating stories and narrative can grab the imagination, and hence change behaviour in the present. thanks for this post.something i have been thinking about a lot recently as well. Maybe its natural becuse of the turmoil we find ourselves in.